On Father’s Day, after I was finished making the sushi, my mom made tapas. My sister always requests them, because she went to Spain over spring break on a trip with some of her teachers and classmates from her high school. She’s such the world traveller… plus she got to go to Kenya in middle school!!! Lucky girl. Hehe I haven’t been out of the U.S. 48 continental states! Anyways, she loved the food when she was in Spain, so my mom tried making some and they came out great! So since I had just finished making Inari-Zushi I figured why not mix them! And let me tell you, it came out great! The tapas have a lot of spices and were very salty, which balances extremely nicely with the sweetness of the inari-zushi. The tapas recipe that my mom used (and that I used here) is from GroupRecipes.com. Sprinkle salt on both sides. Heat the oil over medium heat, then add the garlic. When the garlic starts to turn golden add the shrimp. Stir for about 2 minutes or until the shrimp are just done. Sprinkle in the paprika and parsley. 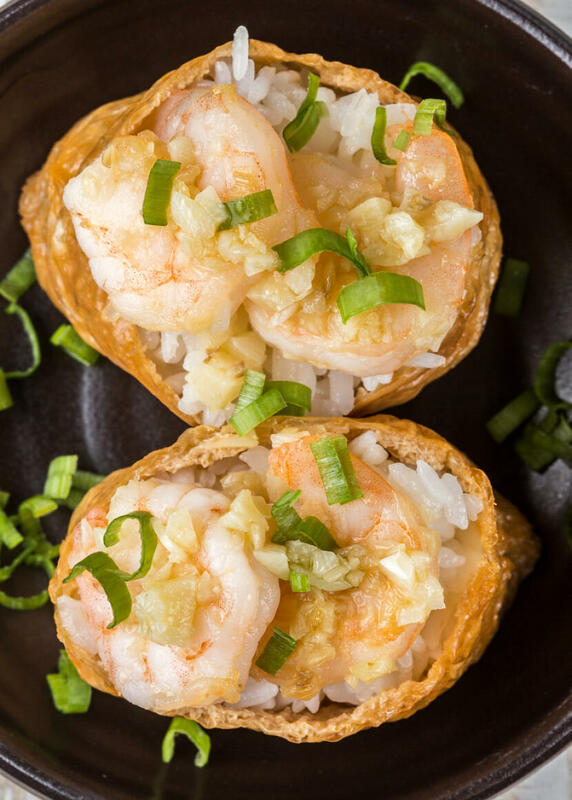 Place four to six pieces of shrimp on the inari, and eat! Wow, great idea! I want some! Yummy! I’ve been thinking of making inari (just have to find the canned tofu pockets) so this is a great inspiration and incentine. Any hopes of having you do some onigiri in the future? Especially the yaki onigiri. I’ve made them twice now and hoping for some tips in keeping them together in the final stage of browning ie. post soy sauce brushing. err… I meant incentive, of course. Perfect mix of the two things I love most: gambas and sushi! Lara – Definitely make some if you can! By the way, your inari pouches come in a can? I have never seen it that way! Are they still really good? I will definitely make some onigiri, especially now that you have requested it! Keep an eye out for it! Cesar – It’s glad to know at least some Spaniards don’t think I’m crazy for making a fusion Japanese/Spanish dish! Enjoy! Though I haven’t bought the inari yet, someone on a blog I ran across posted pics of 2 different brand names of Inarizushi no moto (ie Hime Inarizushi Seasoned Fried Bean Curd) that each came in cans. I have seen the pouches on the web. I’m going to go this weekend to check out the asian grocers’ in town for the inari. If I don’t find it there, there’s a Japanese grocers about 30 min away that I can check. Yum! That looks so good! I might have to give it a try this week, I’ve been on a shrimp kick lately. As for the inari in a can, we actually had some in the asian section of our normal grocery store. I tried making some once (I think you just do it cold but it’s been awhile so I could be mistaken) and the flavor wasn’t as good to me as some other inari I had. So then I saw the pouches that you used in an asian market and bought one of those. Haven’t tried it yet to compare, but this will be a good opportunity! Anyway thanks for yet another good idea! For future reference, the tapas you used are called “gambas al ajillo” – a dish you can find anywhere in Spain. wow! I always learn something new here. You’re truly a Sushi Renaissance Woman! Amy – Very interesting! Let me know when you are able to try the other type of inari… I would love to hear how they compare! Finally picked up a can of the Hime brand inarizushi-no-moto at the city market where we have an oriental grocery store. There’s another place I can check as well. I haven’t opened the flip top can yet but, according to web site I’ve checked out, but there are supposed to be about 16 inari in the can. As to cooking method … you just take them out of the can and stuff with rice. But, I’m pretty sure that I saw a recipe somewhere which suggests pouring a bit of boiling water over the contents to get rid of some of the extra oil and probably to warm them up a bit. Drain quickly and squeeze the inari gently to get the extra water out and then stuff. The inari must retain enough of the seasoning to still have that sweet taste we love. A LJ I read suggested pouring some of the liquid in the can into your sushi rice for extra flavour. 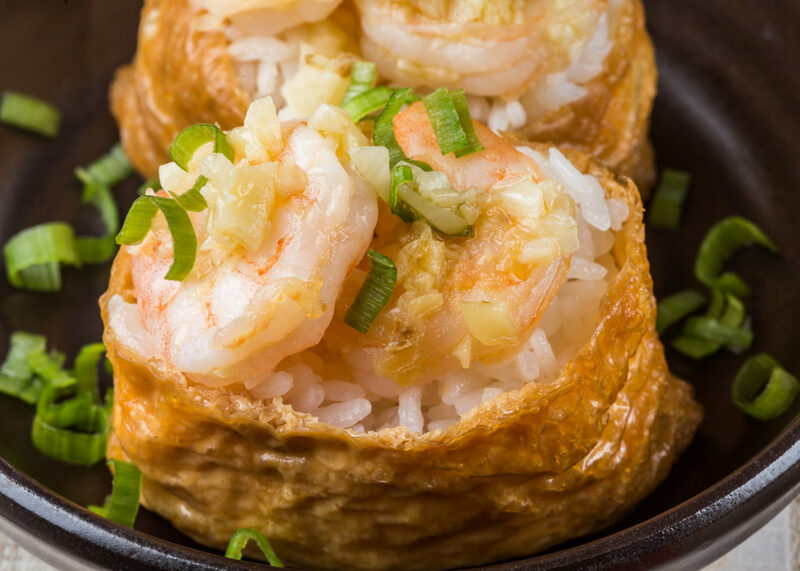 Yvo – Haha I love your comparison to dim sum! I would love to be able to travel like you do… hehe maybe someday! Lara – Thanks so much for describing how to prepare the canned aburaáge (inari packets)! I’m definitely going to have to put a note on my inari recipe for those of you who use the canned aburaáge! I’ve been eating these at my school and they are very addicting! But I was wondering if these are good to eat when I’m trying to diet? Thanks! Check out the nutrition facts on the recipes… they can help you determine whether it is something that you are comfortable eating during your diet. 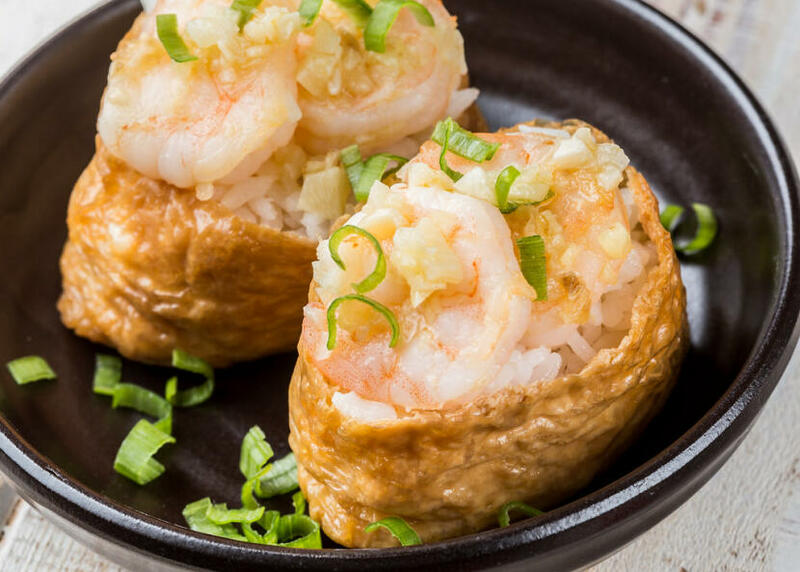 🙂 Also, notice that these include shrimp and a ton of other stuff… if you want the plain inari sushi nutrition facts, they can be found here. The only way I can find inari here in Phila. is in the can. I think it’s alot easier to use.You just open the can and stuff away. It’s really tastey out of the can, it’s kind of sweet with a strong taste of the soy sauce. Just thought I would post this in case some one was thining of using the inari in the can. That is just fascinating…true fusion! This meal sounds very good. So good that I’m going to make it now and look up the ingredients!!!!!! Samantha – Thanks, it sure is! Carman – I hope you enjoyed it!